The Office Rackmount LCD Series UPS is designed to protect home-office servers, PCs, graphic workstations, and commercial electronics. The Intelligent Crystal-Blue LCD diagnostic panel gives administrators immediate, real-time information of the UPSs vitals. LCD diagnostics include Input/Output Voltage, Battery Capacity, Estimated Runtime, Load Level, On Battery, Overload, and Silent Mode. The OR700LCDRM1U has 6 outlets, USB/Serial communication ports, and RJ11/RJ45 network protection. 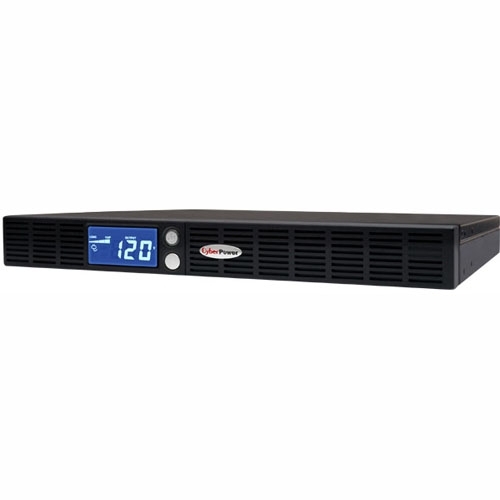 Automatic Voltage Regulation (AVR) ensures that all your connected equipment is receiving clean power and stabilizes the voltage to a nominal 120VAC. PowerPanel Plus Smart-App Management software (included) automatically saves and closes open files and shutdowns the PC in an intelligent and orderly manner. CyberPower also carries a 3-year unlimited warranty, has a professional award-winning Technical Support, and offers a lifetime Connected Equipment Guarantee of $300,000. Awesome UPS for rack mounted home network set up . I purchased this unit to reduce the noise of my VMware box. With the stock cooler the CPU fan would constantly scream even under minimal load. After installing this unit, the computer has quieted down quite a bit. Even under high load the fan noise is a lower pitch so it is much less noticible. Great unit for the low cost. I've had other cyberpower products in the past and haven't had any failures. This was for a 12" deep wall hung rackmount, so the slim depth was the main thing I had to keep in mind when selecting a ups, fit great with lots of rear room still for plugs and adapters.